Passover begins at sundown tonight and ends at sundown on April 27. Passover (Pesach) celebrates the freedom of Jews from Egyptian slavery. During Passover, Jews cannot eat any leavened bread, but they can eat unleavened bread called matzah. Children could read the chapter about Passover from Celebrate! Stories of the Jewish Holidays, written by Gilda Berger and illustrated by Peter Catalanotto. Battles of Lexington and Concord, in 1775, marked the beginning of the American Revolutionary War. About 700 British troops were marching toward Lexington and Concord to destroy military supplies. Approximately 70 Minutemen met the redcoats in Lexington. 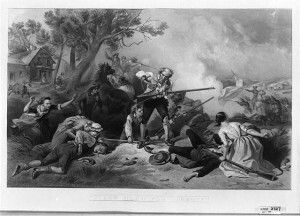 Records do not indicate clearly who fired the first shot, but eight Minutemen died. Ten more Minutemen were injured. One British soldier was wounded. The British continued on to Concord and then turned back toward Boston. Along the way, patriots shot at the redcoats. British casualties came to 250, and American casualties numbered 90. Jon Agee (born Nyack, New York, 1960) writes and illustrates books for children. His books include Milo’s Hat Trick and Ludlow Laughs. Children can visit his interesting website at: Jon Agee. Lucretia Rudolph Garfield (born Hiram, Ohio, 1832; died South Pasadena, California, March 14, 1918) was the wife of James A. Garfield, twentieth president of the United States. Children can visit a website at: Lucretia Garfield. Jean Lee Latham (born Buckhannon, West Virginia, 1902; died Florida, June 13, 1995) wrote books, mainly biographies, for children. Her book Carry On, Mr. Bowditch received the 1956 Newbery Medal. 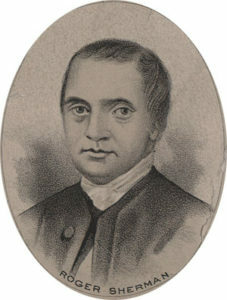 Roger Sherman (born Newton, Massachusetts, 1721; died New Haven, Connecticut, July 23, 1793) was the only patriot to sign four of America’s most valuable documents, the Articles of Association, the Declaration of Independence, the Articles of Confederation, and the United States Constitution. He also served in the House of Representatives from 1789 to 1791 and in the Senate from 1791 to 1793. Children could read the chapter about Roger Sherman in American Revolutionaries and Founders of the Nation, by James Meisner, Jr. and Amy Ruth. Javaka Steptoe (born New York, New York, 1971) illustrates children’s books. He received the 1998 Coretta Scott King Award for In Daddy’s Arms I Am Tall. Steptoe received a 2011 Coretta Scott King Honor Award for Jimi Sounds Like a Rainbow. He also earned the 2017 Caldecott Medal for Radiant Child: The Story of Young Artist Jean-Michel Basquiat. Children can visit his website at: Javaka Steptoe.